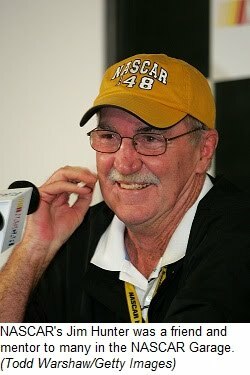 DAYTONA BEACH, Fla. (Oct. 30, 2010) – NASCAR Vice President of Corporate Communications Jim Hunter, whose career in motorsports spanned portions of six decades as both a journalist and public relations professional, died last night in Daytona Beach, Fla. following a 12-month battle with cancer. He was 71. As a young man growing up in his native South Carolina, Hunter was a football and baseball player at the University of South Carolina. Those years preceded a future of being immersed in the sports world, primarily motorsports. Hunter learned motorsports from “both sides” by working as a newspaper reporter/editor and a public relations representative. As a member of the media, Hunter was sports editor of the Columbia Record newspaper; he had an award-winning stint at the Atlanta Journal-Constitution; he was a columnist for Stock Car Racing magazine; and he authored a number of books, including a widely-read biography on NASCAR great David Pearson, entitled “21 Forever." Hunter broke into the public relations business in the 1960s with Dodge’s motorsports operation. He handled public relations for a number of top IndyCar drivers before going on to become the public relations director at his beloved Darlington Raceway and Talladega Superspeedway. In 1983, Hunter was named to his first executive position in his first NASCAR stint, becoming NASCAR’s vice president of administration. In 1993 he was named president of Darlington Raceway and corporate vice president of the International Speedway Corporation. He remained at Darlington until 2001 when he accepted an offer from then-NASCAR Chairman and CEO Bill France Jr. to return to Daytona Beach to lead an expanded public relations effort aimed at responding to the needs of burgeoning media coverage. Hunter won numerous awards during his career, including: the Hugh Deery Memorial Award in 1988; South Carolina Ambassador for Economic Development in 1994; South Carolina Tourism Ambassador of the Year in 1997; the National Motorsports Press Association’s Joe Littlejohn Award in 2005; and the Buddy Shuman Award in 2006. Hunter is survived by his wife of 48 years, Ann Hunter; his children, Scott Hunter and Amy McKernan and his grandchildren Dakota Hunter, and Hunter and Luke McKernan. In lieu of flowers the family asked that donations be made to The NASCAR Foundation or Hospice of Volusia/Flagler County. Funeral arrangements will be announced later. 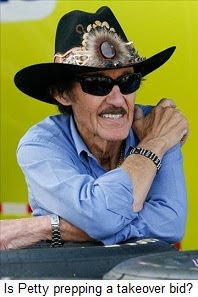 Sirius NASCAR Radio’s Sirius Speedway with Dave Moody has learned that Budweiser has told Richard Petty Motorsports that the team will not receive the final payment on its 2010 sponsorship contract. Bud’s contract called for Kasey Kahne to be the driver of the Budweiser Ford, and when Kahne left the team five races early to join Red Bull Racing, that contract became null and void. There has been no confirmation from either the team or Budweiser, and no word on what the final installment of that sponsorship would have been worth to the team. Uncle Brenny and Tater...Still Waiting! The sale of a Lake Tahoe Ski Resort by Richard Petty Motorsports majority owner George Gillett this week apparently brought far less to the team’s financial coffers than initially believed. Gillett’s Booth Creek Ski Holdings, Inc., sold its stock in the companies that operate the Northstar-at-Tahoe Ski Resort to Vail Resorts Tuesday for a reported $63 million. However, a search of public records shows that Northstar-at-Tahoe actually sold for $80 million in November of 2007 to CNL Lifestyle Properties, a real estate investment trust. CNL’s company prospectus outlines terms of the sale, and makes it clear that since late 2007, Gillett’s company has only managed the resort on their behalf, and not owned it. Industry sources say those management rights likely sold for far less than the claimed $64 million. Further, they say that Gillett personally owns only 2% of Booth Creek Ski Holdings, with his wife accounting for an additional 2%. Thus, Gillett would have received very little cash from Tuesday’s sale. Richard Petty Motorsports confirmed late yesterday that it will field all four cars this weekend at Talladega Superspeedway for drivers AJ Allmendinger, Elliott Sadler, Paul Menard and Aric Almirola. Today's news raises new concerns, however, over the team's long-term viability. Yesterday’s move by majority owner George Gillett to shore-up the finances at Richard Petty Motorsports has apparently not convinced Petty himself to abandon a bid to purchase majority control of the operation. Gillett’s Booth Creek Resort Properties LLC sold its stock in the companies that operate the Northstar-at-Tahoe Ski Resort to Vail Resorts yesterday for $63 million, with that money expected to go directly toward the operation of Richard Petty Motorsports for the remainder of the season. Gillett purchased a controlling interest in the team from Ray Evernham in August of 2007, but reportedly defaulted on the $90 million loan last February. He reportedly refused an offer by lender Wachovia Bank to buy out the loan for $35 million last summer, but has been unable to restructure the debt. Multiple sources with knowledge of the situation tell Sirius Speedway today that between Evernham, Wachovia and Roush, Gillett’s total RPM debt approaches $97 million. 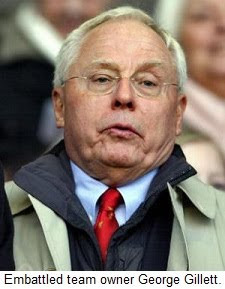 Gillett had hoped to use assets from the sale of his Liverpool English Premier League soccer club to operate RPM and pay some of those racing debts, but the sale was approved by the league for $476 million; much less than Gillett had hoped for. Sports Business Journal is reporting that RPM has hired the Gordian Group, a New York-based investment bank, to search for additional financing. Wachovia Bank has enlisted FTI Consulting to seek additional investors, as well. Petty enjoys a strong relationship with Wells Fargo Bank – parent company of Wachovia – which sponsored Kyle Petty’s entries at Petty Enterprises, and while Wachovia has declined to comment on the story, informed observers wonder if Petty might be able to assemble the financing necessary to purchase the note and complete a defacto hostile takeover of the team that bears his name. 1) Refinance Gillett’s loan. In both cases, the banks have been unwilling to do so. 2) Allow Gillett to soldier on with RPM in hope that he makes periodic payments on the note. 3) Foreclose on the note and seize control of the team. This is not a realistic option, since investment bankers know nothing about running soccer or race teams. 4) Foreclose on the note, shut down the team and sell off its assets. Those assets consist of a few race cars and engines, three or four buildings – though not the team’s current shop, which is rented -- transporters and three airplanes. There is virtually no machinery left from what was once Petty Enterprises and Evernham Motorsports, since the team buys its cars and engines from Roush Fenway Racing. 5) Sell the note to someone else and recoup a percentage of the loan. Royal Bank of Scotland sold the Liverpool Soccer Club to New England Sports Ventures against Gillett’s wishes, for an amount less than what was owed. Wachovia could do the same, if someone comes forward with an acceptable offer. Like he did in Liverpool, George Gillett could find himself forced out of RPM against his wishes. Sources say that Wachovia Bank would likely sell what’s left of Richard Petty Motorsports to someone -- say Petty himself -- for approximately $5 million. Another $10 million would get the team to Daytona for SpeedWeek 2011, so in effect, Richard Petty Motorsports could be wrenched from Gillett's grasp; lock, stock and barrel for approximately $15M. Gillett would walk away debt free. There is one final angle to this story. Multiple sources tell Sirius Speedway that Petty met with representatives from Toyota and Michael Waltrip Racing earlier this week to discuss fielding his legendary #43 out of the MWR stables, if RPM is unable to continue. Sources close to those discussions say they are unlikely to bear fruit. Jeff Gordon told Sirius NASCAR Radio’s Sirius Speedway with Dave Moody that he has not spoken with Kurt Busch about the Martinsville run-in that left him with a damaged race car and a 20th place finish. Gordon bumped Busch while passing him with 115 laps remaining in Sunday's TUMS Fast Pain Relief 500, and Busch returned the favor in spades, spinning Gordon into the inside retaining wall on the frontstretch. The incident was the second between the two this season, after Gordon wrecked Busch on the road course at Infineon Raceway on June 20. "There was good racing all day amongst a lot of guys,” said Busch afterward. "There was respect given for guys when they were getting back to the inside. He shoved me in there and I shoved him back in Turn Four. I didn’t mean to get into him that hard, but over (my) years in the 97, (Gordon was) wrecking the 2 car. Whether you’re a current Kurt fan or ex-Rusty fan, he’s wrecked the 2 car a lot here." Richard Petty Motorsports majority owner George Gillett, Jr., made a major move to shore-up the financial standing of the team today. His Booth Creek Resort Properties LLC sold its stock in the companies that operate the Northstar-at-Tahoe Ski Resort to Vail Resorts Tuesday for $63 million. Gillett reportedly owes approximately $70 million to Wachovia Bank from his purchase of the team formerly known as Evernham Motorsports. It is also believed that he continues to make payments to Evernham for the team, and Evernham told Sirius NASCAR Radio’s Sirius Speedway with Dave Moody that Gillett is current in his payments. The former car owner and championship-winning crewchief declined to discuss the inner workings of the team, beyond confirming that he receives regular updates on RPM’s finances. “As far as I know, there are three spoons in the pot,” said Evernham. 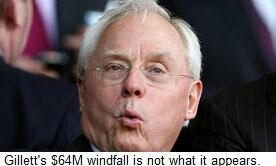 “George Gillett is the majority owner, I’m second and Richard is third.” He declined to divulge specific percentages of ownership, or confirm published reports claiming that Petty owns only four percent of the team. Informed sources say that without the infusion of capital, RPM would not have been able to compete at Talladega Superspeedway this weekend, despite the return of the team’s Talladega chassis and engines by Roush Fenway Racing and Roush Yates Racing Engines late last week. That equipment was repossessed earlier due to lack of payment, but Jack Roush now says RPM’s account is paid in full. Several RPM crewmembers said they were unsure whether the team would still be operational when they returned from Martinsville Speedway, but direct-deposit payroll obligations were made late last week, and the shop is operating as usual today. The team’s financial future was cast into doubt recently when the English Premier Soccer League approved the sale of Gillett’s Liverpool club to New England Sports Ventures for $476 million. That sale price was considerably less than Gillett and partner Tom Hicks insisted the team was worth, and came only after they dropped a temporary restraining order blocking the sale. Gillett threatened to sue NESV for $1.6 billion in damages, but attorney Tom Melsheimer confirmed late last week that the suit had been dropped in accordance with a British court order. He hinted that the legal battle would continue, however, saying "a different picture will be painted" when the court hears Gillett’s version of the facts. There is no word on whether today’s $63 million cash infusion will allow RPM to compete for the remainder of the 2010 season, or on how it might impact Richard Petty’s attempt to secure financing for a purchase of Gillett’s ownership stake. Can King Richard Save Richard Petty Motorsports? There are more questions than answers this week surrounding the future of Richard Petty Motorports, after a bizarre week that began with the departure of star driver Kasey Kahne and ended with reports that Richard Petty himself may be preparing a bid to seize control of the team that bears his name. Kahne departed the team suddenly last week, after blaming flu-like symptoms for his refusal to return to the damaged Budweiser Ford following a crash at Charlotte Motor Speedway. He criticized repeated brake failures on the cars, and claimed a team executive questioned his commitment to the team at Charlotte. The team released Kahne less than 48 hours later, clearing the way for him to join Red Bull Racing for the final five races of this season. Sources say the decision was made – in part – to avoid making the final two payments on Kahne’s 2010 contract. Red Bull will now pay the final two installments of that pact, worth approximately $2M. The situation deteriorated even further last week, when a number of cars, engines and rear gear assemblies were repossessed from the RPM shops by Roush Fenway Racing and Roush Yates Racing engines, due to lack of payment. Sources said nearly $10 million was owed to RFR and Roush Yates, prompting seizure of equipment RPM had planned to use this weekend at Talladega Superspeedway. The cars were returned to last Thursday after a partial payment was made, but the engines remained in the possession of Roush Yates Racing Engines until Friday, when an additional payment was reportedly made. The team’s financial struggles reportedly stem from the recent sale of the Liverpool English Premier League Football Club, owned by RPM majority owner George Gillett. The team was sold recently to a group headed by Roush Fenway Racing co-owner John Henry, but for a price far below what Gillett had hoped for. Gillett reportedly planned to use profits from the sale to finance the race team, but instead was left with barely enough money to pay off a note held by his financier, Royal Bank of Scotland. Gillett has threatened to sue Henry’s New England Sport Ventures for approximately $1.6 billion in damages, but that does nothing to ensure the survival of Richard Petty Motorsports, even in the short term. A series of high-level meetings were held late last week in an attempt to shore-up the team’s status beyond Talladega, but Petty said he will not let Gillett’s financial issues force him out of the sport. "I've been here since 1949 and I'm going to be here till they run me off," he said. He declined to comment on reports that he is attempting to assemble financial backing to purchase majority interest in the team from Gillett, saying, "I haven't got anything to tell you except speculation… and that ain't going to get anybody anywhere. 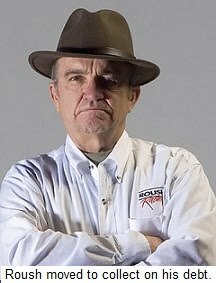 When we do get all of it together, we'll get it together.” Jack Roush confirmed, however, that Petty is working on a takeover bid. Kahne, meanwhile, began his tenure at Red Bull Racing with a 14th place finish at Martinsville Speedway. He will drive the #83 Toyota in the final five races of the season, with Aric Almirola – who ironically had been slated to drive the car before Kahne’s departure from RPM – taking his place in the #9 Ford. Marcos Ambrose will apparently honor the balance of his contract and finish the season with JTG Daugherty Racing. AJ Allmendinger told Sirius NASCAR Radio’s Sirius Speedway with Dave Moody that engines for the team’s four Talladega entries were returned to Richard Petty Motorsports Friday. The team's Talladega cars, engines and rear gear assemblies were repossessed by Roush Fenway Racing and Roush Yates Engines early this week, reportedly due to lack of payment. The cars were returned late Wednesday morning. Allmendinger said the team is preparing cars for the remaining races of the 2010 season, but admitted that he and his management team are working on “worst case scenario options” in case RPM is not able to continue long-term. However, he said his main concern is for the men and women who work behind the scenes at RPM. “Those are my guys,” he said. “I’m going to be OK at the end of all this, one way or another. But those guys put their heart and soul into this race team every week, six days a week. A lot of them live paycheck to paycheck, and I’ve gone to them and promised them I’ll do whatever I can do help. More details are being revealed concerning the current financial situation at Richard Petty Motorsports, including approximately $12 million owed to the team's chassis and engine suppliers and former driver Kasey Kahne. Speaking on the condition of anonymity, a source with knowledge of the situation told Sirius NASCAR Radio’s Sirius Speedway with Dave Moody that RPM had fallen $9-10 million behind in its payments to Roush Fenway Racing and Roush Yates Racing Engines for race cars, engines and rear gear assemblies. That debt prompted Roush to repossess the team’s Talladega cars, engines and gears earlier this week, but the cars were returned to RPM late Thursday morning after a partial payment was made. The engines reportedly remain in the possession of Roush Yates Racing Engines, awaiting an additional payment. The same source revealed that Kahne was owed between $1 million and $1.25 million by RPM, and that those past-due paychecks played a major role in his criticism of the team following last Saturday night’s race at Charlotte Motor Speedway. As of mid-afternoon Thursday, Kahne had not received a signed copy of his release from RPM, potentially compromising his ability to compete for Red Bull Racing this weekend at Martinsville. However, legal experts tell Sirius Speedway that Wednesday's press release from RPM announcing Kahne’s release was legally binding, and will allow Kahne to drive for Red Bull this weekend without violating his contract with RPM. A second source within Richard Petty Motorsports confirmed that a series of high-level meetings were held throughout the day Thursday in an attempt to ensure that the team will be able to compete past next weekend's race at Talladega Superspeedway. Questions abound today about the future of Richard Petty Motorsports, after a bizarre series of events in the last 24 hours put the financial solvency of the operation in doubt. Yesterday, a number of cars, engines and rear gear assemblies were repossessed from the RPM shops by Roush Fenway Racing and Roush Yates Racing engines. RPM was reportedly left with nothing for AJ Allmendinger, Elliott Sadler, Paul Menard and Aric Almirola – replacing Kasey Kahne, who was released late Wednesday – to drive next weekend at Talladega Superspeedway. Sources say a deal was struck late yesterday to return the Talladega cars, though they are still without engines or rear-end gears. “The outlook was pretty bleak last night, and it’s not much better now,” said a Richard Petty Motorsports employee earlier today, on the condition of anonymity. “The Martinsville cars are loaded on the transporters and ready to go, but after that, it’s pretty up in the air. Rumors were flying last night, and nobody was being told anything. A bunch of crew guys left the shop last night with their toolboxes with them.” A number of RPM employees have reportedly been warned that they could be unemployed as soon as Monday. Spokespersons for both RPM and Roush Fenway say that no more cars will be delivered. Sources tell Sirius Speedway that while coincidental, the dispute is not related to this week’s repossessions. Instead, the dispute apparently stems from a series of past-due bills owed to both Roush Fenway and Roush Yates Racing Engines by RPM. Calls placed to both Richard Petty Motorsports and Roush Fenway Racing seeking comment have not been returned. In a related story, Kahne will begin his planned tenure at Red Bull Racing five races earlier than planned, after being released from the #9 Budweiser Dodge late yesterday. Kahne will now drive the #83 Red Bull Racing Toyota for the final five races of the season. Aric Almirola, who had been slated to drive the #83 Toyota, will replace Kahne in the #9 Dodge this weekend at Martinsville. Reliable sources tell Sirius Speedway that Marcos Ambrose will not accelerate his move to RPM, electing to honor the balance of his 2010 contract with JTG Daugherty Racing. Kahne’s crewchief, Kenny Francis, will be atop the pit box for Almirola this weekend at Martinsville, and said he expects to finish the season with RPM before joining Kahne at Red Bull Racing next season. Francis told ESPN, "If they want me (at RPM), I will be there." UPDATE: A number of Richard Petty Motorsports employees who had planned to join Kasey Kahne at Red Bull Racing next year were reportedly told by management today that that their services are no longer required, effective immediately. SPEED.com reported today that one of the reasons Kahne was released by the team is that RPM owes him a substantial amount of back salary. Was Kasey Kahne sick Saturday night at Charlotte Motor Speedway, or simply sick of driving for Richard Petty Motorsports? That's the $64,000 question this week, after Kahne declined to hop back into his Budweiser Ford after crashing on lap 124. Kahne claimed to be suffering from flu-like symptoms, but his refusal to return to competition after repairs were made prompted one unnamed team member to question his commitment. “I'm not going to say names, but I was told that I need to start doing my part," said Kahne, who gave way to relief driver J.J. Yeley Saturday night, but was able to compete in his Kasey Kahne Foundation five-kilometer charity race the following day. "(That) is what one guy told me last night after the race. I can't control the issues I've had this year. I don't know how many parts I've broke. I'm doing my part. I just need the car. I work as hard as anybody out there." 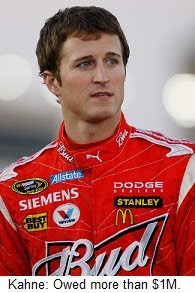 Kahne admitted that frustration with recurring brake issues played a role in his decision not to return to the track. "I lost it," he said. "I came into the race thinking we had a shot to win. We were a little bit tight, but still actually passed cars and really felt good. And then boom, my brakes are gone. It's not like you have half-brakes, like you can pump them. Your foot goes to the floor. It bottoms out. It's a joke." He said he vomited after exitting the car Saturday, and did not feel obligated to climb back into a sub-par race car while ill.
Kahne said his brakes have failed three times this season and twice in the last three races, adding that repeated complaints to team management have gone unanswered. He blamed the issue on RPM's choice of brake fluid, saying the product causes premature brake fade and does not allow drivers to cool and regain their brakes during a race. He admitted, however, that no other Richard Petty Motorsports or Roush Fenway Racing driver has experienced similar problems. 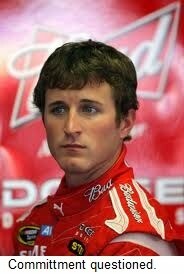 "I can’t control the issues I’ve had this year," said Kahne. "I don’t know how many parts I’ve broken, how many shifter handles, control arms, brakes. If I really thought about it, I could come up with all kinds of stuff." Kahne is now winless in his last 31 starts and has dropped out of the Top-20 in championship points. Clearly, the remainder of the season will be a race to see whether he runs out of races before running out of patience. All parties have done an admirable job pf holding things together in the months since Kahne revealed that he will leave RPM at season's end for a one-year stint at Red Bull Racing and an eventual ride in Rick Hendrick's #5 Chevrolet. In the end, though, Kahne's "lame duck" run at Richard Petty Motorsports appears destined to end badly. It’s now been almost 48 hours since the 2011 Class of the NASCAR Hall Of Fame was announced, and the sniping continues unabated. Rather than celebrate the five honorable men chosen for induction to the Hall next May, many are now busying themselves by second-guessing the process and criticizing the chosen and the choosers. “Half the voting room (was) close friends with Jarrett, a man who doesn't have a mean bone in his body,” wrote Bowles. “Whoever said `nice guys finish last’ obviously didn't sit in a Hall of Fame discussion where the `personality’ quotient shouldn't be quantified, but inevitably becomes the `X’ factor." Bowles clearly would prefer a analytical, statistics-based selection process; eliminating any consideration of off-track accomplishment, charisma or personality in favor of a strict course in mathematics. In his world, the man with 50 career wins gets in before the man with 49, no matter what other contributions they may have made to the sport. In his world, the only difference between Barry Bonds and Henry Aaron is seven home runs, with no mention of how they got there. In today’s column, Bowles called a brief ceasefire in his attack on the voting panel to cite Allison’s “lifetime of tragedy you wouldn't wish on anyone” as a reason for voting him into the Hall. Apparently, sentiment is allowed into the process, after all. But only if it suits your personal needs. 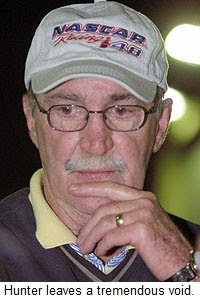 Bowles accused the voting panel of putting personal feelings and petty grudges ahead of the best interest of the sport, saying they penalized Waltrip “for simply opening his mouth and speaking his mind one too many times.” He also accused voters of ignoring Yarborough because of his support of the ill-fated TRAC series decades ago. Conveniently, however, he declines to identify any of the voters he believes to be guilty of such skullduggery. For the record, this year’s 52-member voting panel was an extremely eclectic group. It was comprised of 14 media members, 11 current or former track owners, eight NASCAR representatives, three manufacturer representatives, 10 retired drivers, car owners and/or crewchiefs, four industry reps and two executives from the Hall of Fame. The 53rd ballot was cast according to a fan vote. That panel sequestered itself for more than two hours Wednesday debating their final selection, and according to many who were there, there were numerous turns of sentiment throughout the day. That doesn’t sound like a group that walked in with its collective mind made up due to a decades-old vendetta, does it? And yet, that’s what Bowles (and others in the NASCAR community) would have you believe. “Voting with your heart is a dangerous game,” wrote Bowles, “an ugly habit setting precedent for years down the road when the choices won't be quite so much of a slam dunk.” Thankfully, just the opposite is true. Richard Petty was a slam-dunk selection to the NASCAR Hall Of Fame. But even his spot in the Hall is owning to equal measures of statistics and sentiment. There’s what he did in the sport – 200 career wins and seven championships – and there’s what he did for the sport, signing thousands of post-race autographs each weekend in dusty pit areas across the south in an effort to say “thank you” to the fans. Men like Petty, Bud Moore and Ned Jarrett are not defined by a spreadsheet of their wins and losses. NASCAR is the same way. Like Bobby Allison, Darrell Waltrip and the others on this week’s 25-man list of nominees, NASCAR is more than mere numbers on a page. It is people; people with hearts, souls and feelings that must surely be hurt by the childish and petty bickering of men who should know better. NASCAR is nothing without its heart. Someday, the naysayers and conspiracy theorists of this world may finally come to understand that fact. Yesterday provided a shining example of everything that is good about NASCAR. The sport chose five of its favorite sons: three-time Cup Series champion David Pearson, inaugural Daytona 500 winner and three-time champ Lee Petty, legendary car owner Bud Moore, two-time champion and award-winning broadcaster Ned Jarrett and former champion and 84-time race winner Bobby Allison for induction into the NASCAR Hall of Fame. The day was filled with emotion, tears and high drama, as NASCAR embraced five larger-than-life personalities and thanked them for their considerable roles in building the sport. Today, less than 24 hours later, that feeling is gone, replaced by the petty bickering of a select few observers who sadly seem incapable of letting anything good go unspoiled. While acknowledging the accomplishments and credentials of Wednesday’s honorees, they cannot resist chastising NASCAR for not including their favorite driver, turning what should be a feel-good moment for the sport into just another competition to see who can get to the Finish Line fastest, and at whose expense. There is no writer in the sport for whom I have more respect than Hinton. He will almost certainly have a spot of his own in the Hall Of Fame one day. But on this topic, he is most certainly wrong. Induction into the NASCAR Hall Of Fame is not a race. It’s not a competition to determine who is better than whom. I walked through the Hall Of Honor just hours before yesterday’s ceremony, and the five men enshrined there were not ranked, in any way. There was no “Best Of All Time,” just a dignified listing of each driver’s accomplishments, both on and off the racetrack. Pitting driver against driver as Ed Hinton and others attempt to do serves no purpose other than to cheapen the process. It robs Wednesday’s honorees of their much-deserved moment in the sun. It diminishes the efforts and integrity of the voting panel that poured heart and soul into their selections. Worse yet, it paints the 20 men not selected for the 2011 Class as losers, when nothing could be further from the truth. The process of choosing five Hall Of Famers from a list of 25 nominees is akin to taking an exam where there are no wrong answers. There were no “winners and losers” yesterday. All 25 nominees were then – and continue to be now -- worthy of inclusion in the Hall. Pearson, Petty, Moore, Jarrett and Allison were not better or more qualified than the other 20 nominees. They were simply next in a decades-long line of equals, waiting patiently to take their place among the legends of the sport. Hinton writes that men like Cale Yarborough, Glen Wood, Dale Inman and Darrell Waltrip were “denied” spots in the Hall Of Fame yesterday. That’s not true. They were, at worst, deferred. And while they were most certainly disappointed yesterday, that feeling will pass. Just moments after last year’s announcement, David Pearson walked sullenly from the Hall Of Fame, hurt (and perhaps even angry) not to be included in the inaugural class. One year later, everything changed. One of the sport’s toughest, most stoic personalities fought back tears as he spoke of being chosen for the Hall’s second class. There was no bitterness, no “I should have been here last year;” just humility and honor to be included among the sport’s all-time greats. Some wish the NASCAR Hall Of Fame could be filled instantly. That, I suppose, is understandable. Modern society has traded-in its attention span for a life of instant gratification. We eat our food over the sink, straight from the microwave because cooking and setting the table take too much time. We prefer Monday morning highlight packages to watching the actual race, because three hours seems like too long to sit still in an ADHD world. We spend our money on $300 sneakers and let the 401K go begging, because there’s no time to worry about next week, much less old age. We’ve forgotten that good things take time. One win – or even one championship -- does not make a Hall Of Fame career. It takes decades of sweat, sacrifice and determination, and there is no short-cut on the road to greatness. If we’re willing to accept that Hall Of Famers are not made overnight, why can we not accept that a Hall Of Fame cannot be filled in that same amount of time. Stewart-Haas Racing made it official this afternoon, confirming that ExxonMobil has signed a multi-year sponsorship agreement to make Mobil 1 the co-primary sponsor of Tony Stewart’s #14 Chevrolet, along with Office Depot. Mobil 1 will serve as major sponsor in 11 races and serve as an associate backer in the remaining 27 races, including the two non-point events. ExxonMobil will also provide the team with Mobil 1 lubricant technology and engineering support, and serve as an associate sponsor of Ryan Newman’s No. 39 Chevrolet. Mobil 1 replaces Old Spice, which announced earlier this year that it will not return in 2011. Shane Hmiel has faced more than his share of battles in the last 30 years. Now, he faces his toughest challenge yet. Hmiel was critically injured Saturday night in a savage crash during qualifying for the USAC Silver Crown “Sumar Classic” at the Terre Haute Action Track. Hmiel’s car bicycled onto its right side and slammed the concrete retaining wall cage-first, collapsing much of the roll cage and causing critical injuries to his neck and back. He was unresponsive when airlifted to Indianapolis Methodist Hospital, where he is listed in critical but stable condition in the hospital’s Intensive Care Unit. 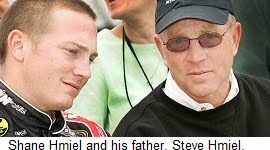 Hmiel's father, Steve, is Director of Competition at Earnhardt Ganassi Racing, and flew directly from Auto Club Speedway to his son’s bedside in Indianapolis. His mother, Lisa, flew there from the family’s home in Pleasant Garden, NC, and has provided periodic updates from his bedside at Methodist Hospital. He underwent surgery to repair two severe compression fractures in his neck early Sunday evening and Lisa Hmiel called the procedure “very successful.” While doctors say Hmiel suffered a spinal cord injury in the crash, he has displayed movement in his upper extremities. Monday, Lisa Hmiel wrote, “He looks better this morning, his color is better. (He) opened his eyes at Steve’s voice. No head trauma.” She cautioned that her son faces major surgery on his broken back later this afternoon, adding that he remains under heavy sedation and is resting well. Saturday’s crash is the latest in a series of setbacks for Hmiel, who was once thought to be on the fast track to a big time NASCAR career. He raced seven times in what is now the NASCAR Sprint Cup Series, and made 83 career Nationwide and 29 Truck Series starts. Sadly, he also struggled mightily with addictions to marijuana and cocaine, and was suspended no less than three times for violations of NASCAR’s substance abuse policy. The third suspension led to a lifetime ban from the sport. The suspension served as a much-needed wakeup call, forcing Hmiel to face his addictions and deal with them for the first time. A stint in rehab allowed him to alter his lifestyle and shed his demons, highlighting a previously undiagnosed bipolar disorder that contributed significantly to his struggles with substance abuse. In time, he even found a way to return to the sport he loved, turning his attention to the Open Wheel ranks. "When Shane started running Silver Crown cars and midgets I was like, 'Oh man, this could be interesting,'” said longtime friend Tony Stewart. “He had never driven those types of cars, (but) he was never scared of it. He never backed down and said, 'I have to learn this.' He's given 110-percent ever since Day One, and he's really turned into a great open-wheel driver." Hmiel won six races in USAC’s three national series this season, including four in the headline Sprint Car ranks. In August, he signed a deal to race part-time in the Firestone Indy Lights Series, and while physical problems prevented him from making his planned debut at Chicagoland Speedway later that month, Hmiel finally appeared to be pointed in the right direction once again. That all changed Saturday night, in the aftermath of a crash that leaves his career – if not his survival – in doubt. “(That kind of accident) doesn't happen a lot in open-wheel racing,” said Stewart, who mentioned Hmiel in Victory Lane at Auto Club Speedway Sunday. “It was just a freak accident that happened; the way that he crashed, the way he hit the concrete wall. Not too many guys hit like that. But it was a devastating hit, and obviously his injuries reflect that. Late Sunday, Steve Hmiel thanked the many fans and friends who have offered their prayers in the last 36 hours, saying his son has a "long road to recovery.'' More prayers will surely be needed for a young man who now faces the toughest battle of his life. MLB.com is reporting today that that the English Premier Soccer League has approved a $476 million bid by New England Sports Ventures --- owners of the Boston Red Sox – to purchase the Liverpool franchise from Richard Petty Motorsports majority owner George Gillett, Jr., and his partner, Tom Hicks. The deal is expected to face a court challenge from Gillett and Hicks, who stand to lose approximately $223 million on the deal and say the club is worth approximately twice what NESV has offered. Gillett and Hicks must repay their major creditor -- Royal Bank of Scotland -- $445.5 million by October 15; roughly $382 million in loans and another $63.6 million in fees. If they succeed in blocking the sale in British High Court next week, they will be forced to either repay the bank or refinance their debt to avoid penalties from the league. Rockingham Speedway opens its gates Saturday for a doubleheader program featuring the season-ending ARCA “American 200” and the traveling UARA Late Model Series. Hopefully, history will not repeat itself. 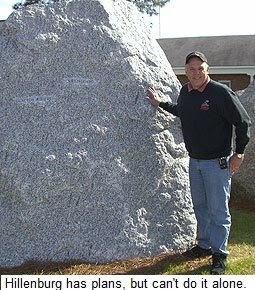 "The Rock" was crossed off NASCAR’s Sprint Cup schedule in 2004 when fans abandoned its legendary high-banks in favor of more modern venues. 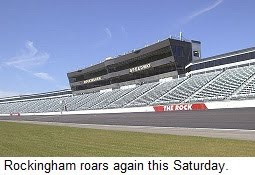 I was there for the track’s final race in late 2004, and everyone knew Rockingham was on shaky ground. Fans had a chance to send a message that day and avoid having one of the country’s most storied stock car venues excised from NASCAR’s Sprint Cup, Nationwide and Camping World Truck schedules. Rockingham appeared to have reached the end of the line. Where the thunder of stock cars once filled the Sunday afternoon air, there was nothing but silence and the memory of what once had been. The track sat idle for three long years, collapsing upon itself as many of the fans who refused to support it loudly bemoaned its demise. Then, against all sane advice, former ARCA and Nationwide Series racer Andy Hillenburg purchased the historic, D-shaped oval. “Indiana Andy” brought the speedway back from the brink, reopening “The Rock” amid great fanfare in 2008. He drew a solid crowd for his first event; an ARCA race that featured a stirring battle between NASCAR veteran Kenny Schrader and teen sensation Joey Logano. Since then, however, fan support has dwindled again, despite Hillenburg’s best promotional efforts and bargain-basement admission prices. Hillenburg has plans for the track that go well beyond regional Late Model racing. Rumors have circulated recently about a possible return of the NASCAR Camping World Truck Series to Rockingham, but in order to do that, the track will have to install hundreds of feet of SAFER barriers at a cost of nearly a million dollars. Hillenburg says he can get the money, but only if area race fans do their part by supporting the speedway. "A lot of people have their eye on Rockingham this weekend," said Hillenburg this week. "For a lot of reasons." There will be a number of familiar names in Saturday’s ARCA field, including former Rockingham Sprint Cup Series winner Steve Park, who returns to the site of his emotional 2001 victory in a car painted identically to his former Dale Earnhardt, Inc./Pennzoil Chevrolet. Camping World Truck Series favorite Ricky Carmichael is in tomorrow afternoon’s field, as is Ty Dillon, grandson of Richard Childress and younger brother of Truck Series star Austin Dillon. Notable in the UARA field is recently crowned 2010 Rookie of the Year Robert Johnson, whose NASCAR Hall of Fame father, Junior Johnson, will be in attendance to guide his son’s effort. Despite a dirt-cheap $20 advance ticket and bargain-basement family packages, Hillenburg said sales through the track’s website -- www.rockinghamracewaypark.com -- have been steady, at best. The first green flag of the day flies at 11:00 AM Saturday morning, with the headline ARCA event set to roll at 1:30. Sirius NASCAR Radio’s Sirius Speedway with Dave Moody has learned that veteran Donnie Wingo is the leading candidate to fill the vacant crewchief position with Wood Brothers Racing. Wingo will replace David Hyder, who left the team earlier this week after overseeing the operation for the past two seasons. 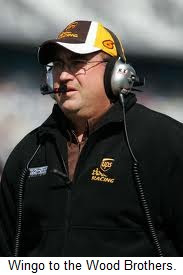 Wingo most recently served as crewchief for David Ragan’s UPS Ford at Roush Fenway Racing, before being replaced earlier this month by Drew Blickensderfer. With Bill Elliott at the wheel, Wood Brothers Racing has managed two Top-20 finishes in 10 Sprint Cup Series starts this season, with a best finish of 16th at Atlanta Motor Speedway in March. A spokesperson for Wood Brothers Racing declined to comment on the story earlier today. Richard Petty Motorsports majority owner George Gillett has fired the Board of Directors of his Liverpool soccer club in an attempt to derail a takeover of the club by New England Sports Ventures, owners of the Boston Red Sox. The board was scheduled to meet yesterday to consider bids from two potential buyers, but Gillett and co-owner Tom Hicks filed an injunction claiming the board was not acting in their best interest by entertaining those offers. 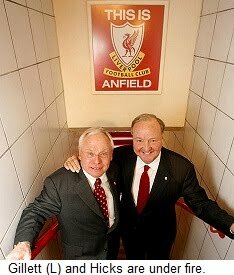 The injunction sought to replace board chairman Martin Broughton and directors Christian Purslow and Ian Ayre with Hicks’ son, Mack Hicks, and Lori Kay McCutcheon, giving Gillett and Tom Hicks majority control of the club. Broughton was hired by Gillett and Hicks after their lein holder, Royal Bank of Scotland, demanded that they expedite the sale of the team. Broughton and his fellow directors are contesting the injunction. New England Sports Ventures is controlled by John W. Henry and a group of partners that includes the New York Times Company and television producer Tom Werner. They purchased the Red Sox in 2002 and a subsidiary of NESV – Fenway Sports Group -- purchased a 50% ownership stake in what is now Roush Fenway Racing in February of 2007. NESV is offering approximately £300 million for the club; enough to cover the £280 million in loans and fees owed to Royal Bank of Scotland by Gillett and Hicks. That loan became due in October of last year, but RBS has been reticent to take over active management of the team. Gillett and Hicks are determined to profit from any sale of the team, and insist that it is worth significantly more than the £300 million offered. RBS is currently considering whether to refinance Gillett and Hicks or force them out. 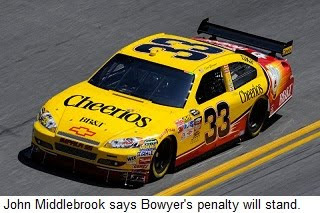 National Stock Car Racing Chief Appellate Officer John Middlebrook has upheld the penalty for the No. 33 Richard Childress Racing Chevrolet, with two revisions. Crewchief Shane Wilson’s fine was reduced from $150,000 to $100,000, and Wilson and car chief Chad Haney’s suspensions were lowered from six races to four. Both remain suspended from NASCAR until Nov. 3 and are on probation until Dec. 31. The loss of 150 championship owner and driver points was left intact. Sirius Speedway has learned that a large sinkhole has appeared in the infield at Charlotte Motor Speedway, not far from the 1.5-mile track’s back straightaway. The sinkhole may have been caused by heavy rain in the region in recent days, and crews using excavators and heavy equipment have already begun filling the hole. It is not expected to impact next weekend’s NASCAR Sprint Cup Series Bank of America 500 events. NASCAR is disputing allegations by Richard Childress Racing’s top witness that the team was prevented from examining Clint Bowyer’s Chevrolet in the days following his disputed win at New Hampshire Motor Speedway. Dr. Charles Manning owns Accident Reconstruction Analysis in Raleigh, N.C., and was hired by RCR to testify on the team’s behalf before the National Stock Car Racing Appeals Board last Wednesday. 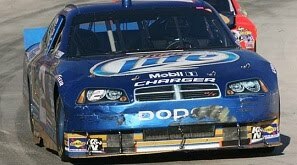 Manning testified that the rear of Bowyer's car was knocked out of tolerance when pushed by a wrecker after running out of fuel; a theory that was ultimately rejected by the panel. NASCAR’s Managing Director of Corporate Communications Ramsey Poston bristled at those accusations Saturday at Kansas Speedway, calling them “patently untrue.” After consulting with Vice President of Competition Robin Pemberton and Sprint Cup Series Director John Darby, Poston said, “Dr. Manning never asked to see the car at any time.” Poston also revealed that Richard Childress Racing was free to examine the car “anytime they want” and was well aware of that open-door policy. Busch, Reutimann Illustrate The Harsh Truth Behind "Boys Have At It"
Kyle Busch dropped from third to seventh in the Sprint Cup championship chase Sunday at Kansas Speedway, and he has David Reutimann (and himself) to blame. 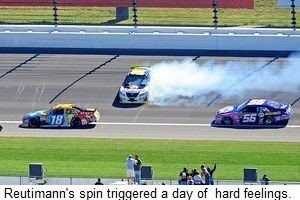 In-car video showed Reutimann was only 12-14 inches from the bottom of the racing groove, however, causing the Zephyrhills, Fla., driver to insist that he was the latest victim of Busch’s much-discussed aggressiveness. "I don't care whether you're in the Chase or not," he said. "You better think about who you're running into before you run into them. You won't get respect as a Chaser if you don't respect everyone else." Reutimann responded in kind with 112 laps remaining, forcing Busch – then running seventh – into the backstretch wall and spinning himself out in the process. Busch pitted under the ensuing caution with damage to both the front and rear of his M&Ms Toyota, and battled those problems for the remainder of the day before finishing 21st. Asked if their second clash had been intentional, Reutimann deadpanned, “What do you think? Maybe I just got tight." 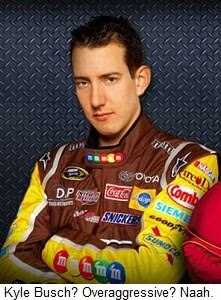 “It's unfortunate he elected to do what he did (to) a guy in the Chase,” complained Busch after the race. “He could have wrecked me next year in any of the first 26 races." Reutimann remained unapologetic, saying, “You can say all you want about Kyle being an aggressive driver. You guys (in the media) can sugarcoat it. He just rolled over me. I'm at the bottom of the track and he had the whole top of the track to go to, but I got wrecked." There will be no shortage of debate in the coming days about the appropriateness (or lack thereof) of Reutimann’s actions. Some will argue that Chase drivers deserve special treatment due to their championship status, while others believe it is the Chasers’ job to ensure that none of their peers feel compelled to send a little “frontier justice” their way.